There is something really appealing about a good garden. It is so satisfactory for both the gardener and any guests who happen to see it when it is well taken care of, and even better, in full bloom. These things don’t just happen though, gardens take a lot of care whether they are flower gardens or vegetable gardens. There is a reason the term “green thumb” was coined. Part of this green thumb is having the proper tools and knowing how and when to use them. There are many options when it comes to garden tools and some that work for situations that others don’t work in. It is easy to assume you can figure it out without buying special tools, but you will really be saving yourself a lot of time and heartache by equipping yourself with the tools you need to do the job right. 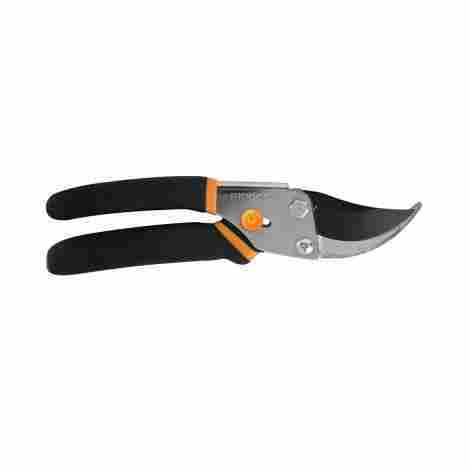 No garden tool set is complete without a good pair of pruning shears and that is exactly what you get with this product. They are sharp and capable of easily and smoothly cutting branches up to ⅝ of an inch thick. They are made completely of steel and come with a lifetime warranty. The blades on these shears are coated with a low friction coating that helps them to glide through branches, and remain sharp long term, despite heavy use. In addition, the coating helps them to resist rust and prevents the buildup of sap or other debris. Company’s don’t typically offer a lifetime warranty if they expect their product to fail within a short amount of time. These are built to last for a long time and even to remain sharp for a long time. They are resistant to rust and have a groove to prevent any sap from building up and even come with an easy to use, ambidextrous, blade lock for safe and easy transport and storage. This awesome set of shears will come to you at an equally awesome price. Your purchase here will hardly be noticed by your wallet or bank account but will make a big difference in how well groomed your garden, trees, and bushes are. You will be very happy with this purchase and feel as if you got a great deal. Sometimes you need more than just a set of shears. If you have any sort of tree trimming higher up, you will also need a set of loppers. These have a 22 inch handle that allows you to reach higher and they will also cut a larger diameter of 1 and ½ inches. They are great to use for cutting live, green branches. This pair of loppers comes equipped with shock absorbing bumpers just beneath the blade. This makes it so that there is no jarring at the end of your cut as all of the shock is absorbed. This is smoother both for you and for the tree or anything living in it that you don’t want to disturb. The hardened steel blade on this unit is guaranteed to stay sharp even with heavy use. It is coated so it is also resistant to rust and helps it to glide through branches, avoiding any gum up issues from sap. Considering what you are getting with this purchase, you are getting good value for your money. These loppers are relatively inexpensive, but will last you a long time and work hard for you when you need them. They are more expensive than others on this list, but they are also a lot bigger than others on this list. Moving on from loppers and shears, there are various other garden tools you need in order to be fully functional. 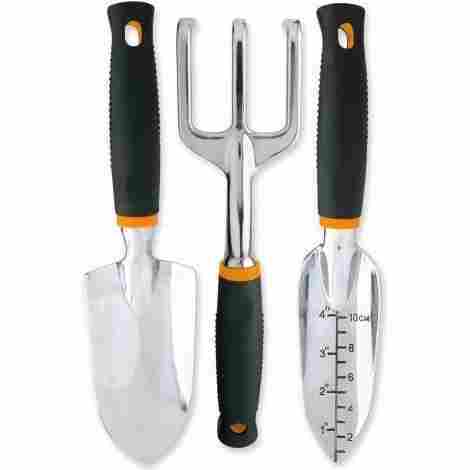 This three piece set includes a trowel, a cultivator, and a transplaner that features gradation marks. You will be able to dig, weed, aerate, and transplant with ease with this set. The handles on these tools are soft and designed specifically to reduce hand and wrist fatigue. This ergonomic design will allow you to work just a little bit longer and finish up what you started without having to take as many breaks. The end of the handles have pads for enhanced leverage and also include a hang hole so that storage is a breeze. 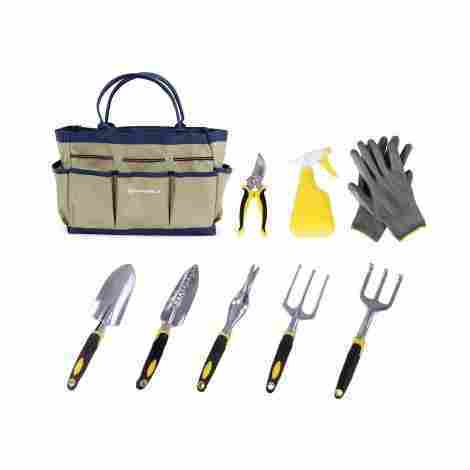 This set includes a trowel that is perfect for digging and loosening the dirt. 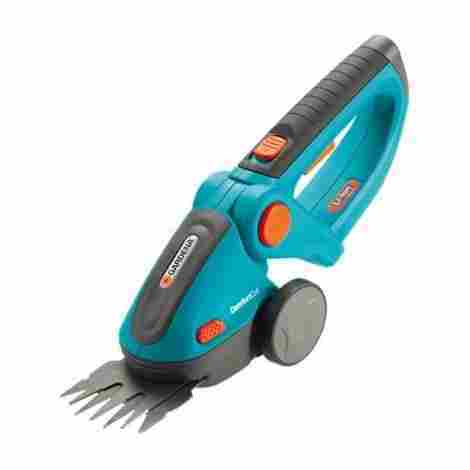 It also includes a cultivator that will help in removing weeds and aerating the soil. The transplaner that comes in this set is perfect for transplanting flowers and small plants and includes gradation lines so you know exactly where you are at. This set comes to you at a great price. Many of your gardening needs will be taken care of with this one set. Considering that you get three pieces at not much more than a reasonably priced single too you are getting a great deal. You will be happy with your purchase and your garden will bear the fruits of your ability to perform more efficient work in it. This tool is exactly what it sounds like. It will allow you to remove weeds from anywhere in your yard or garden without having to bend over. It is 45 inches tall and is a good height for most people to stand and very effectively remove weeds and their roots. It is made with a bamboo handle and a powder coated metal head. This ingenious tool allows you to do all the weeding in your lawn or garden that you need to without having to bend over. This is great not only for your knees, but also you back, and will even keep your fingernails clean! If you struggle to garden because of all the bending, standing, and moving involved but love it as a hobby, this garden tool is a must-have. Made in 1913, this tool came to be long before chemical weed killers did. It is simple and effective and does the job as well in 2018 as it did in 1913. 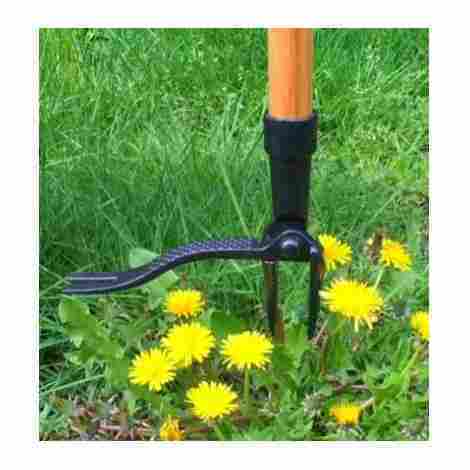 If you are wary of spraying chemicals all over your yard and have small children or pets running around constantly, it will be well worth your time to look into this weeder. While it is a decent initial purchase, it will absolutely pay off in the long run. Depending on the weed killers you use, you will equal the amount spent on this one in a very small amount of time. It is cost-effective and the gift that keeps on giving for years - as long as you are willing to put in the manpower required to get it doing its job. Your knees and back will thank you and you will be happy with this purchase. Anyone with children knows that one of their favorite pastimes is doing what mom or dad are doing. More often than not, they also want to use your tools which can sometimes be safer than others. Why not get them their own set? This tool set comes with 4 separate tools that can be used for play but are also completely functional gardening tools. This set comes with a garden hoe, rake, shovel, and leave rake. This will allow your kids to help you very effectively with your yard work whether you are cleaning up leaves in the fall or simply getting your garden ready in the spring. They will also be able to help you weed and plant their favorite vegetables. All the details here are similar to what you would find in full-sized tools. They have hardwood handles with metal tools at the end. They even come with a leather loop at the top for easy hanging and storage when not in use. If you are a very tiny adult, these may be a good option for you as well. Toys run pretty expensive these days and don’t always inspire active play. These, however; cost just about what any other set of garden tools on this list costs (which is not too expensive) and will have your kids happy and active right alongside you. That time spend learning and bonding is priceless and you will absolutely love that you spent the money that you did on these tools. 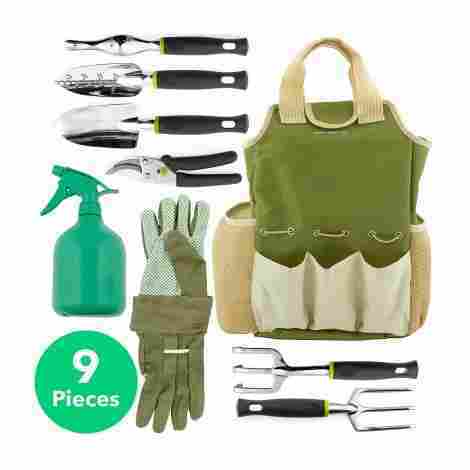 This tool kit comes with everything you need to effectively garden. It has nine pieces including a trowel, hoe, spade, weeder, cultivator, spray water bottle, pruning shears, gloves, and a carrying bag to carry to wherever you need them or to put them all in when not in use. When you buy this set you get tools that are made of high quality, rust resistant aluminum. They are strong and able to dig into hard dirt or cut and saw off solid branches. 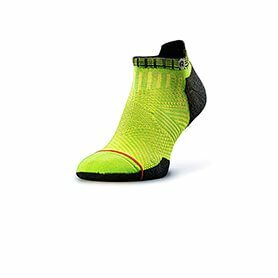 The grips are ergonomically designed and are soft and comfortable. The tools are easy to hold for all hand sizes, making them a great option for everyone - including children and seniors. The included carrying tote is a fashionable green and has enough space to fit all of the tools that come in this set. It has sturdy loops so is easily carried to wherever you need it to be. There is also a larger interior pocket that is perfect for storing extras like seeds, additional tools, or other gadgets you may need. You get a lot of pieces when you buy this set. More than any other set listed here. However; you are not paying any more for this set than you would for another. It is very cost effective and will set you up for gardening very well. If you are a newbie and need a good set of tools, this is a great option. This tool does is designed by gardeners and made in the USA. It is made with a tempered steel blade and has a soft, comfortable handle made out of recycled plastic that works for both left and right handed gardeners equally well. It is a great option for seasoned gardeners as well as newbies and will greatly enhance your gardening experience. This tool can be used for a number of different gardening tasks. The blade functions as a “steel fingernail” and is perfect for weeding, digging, planting, and cultivating. You can scalp, edge, de-thatch, dig, furrow, plant, and harvest with ease. You will find that this becomes your go-to. The best products are made by the people who actually use them. They know exactly the shape, size, and functionality needed because they are out doing the work every day! It is very different than envisioning something that “should” work in an office somewhere. This tool is made by gardeners and is sure to please gardeners. For all that it is capable of doing, this comes to you at a very reasonable price. It is towards the bottom of our list price wise and near the top in functionality. If you want one tool to do it all with instead of trying to get various different ones, then this is the tool you need in your life. Very often, the best option when you are just getting started or need a refresh is to get a set of tools that all match each other, compliment each other, and come with a carrying case to boot. That way you don’t have to go searching for separate pieces only to end up with a hodge podge set that is hard to move around. This gardening tool set comes with 9 separate pieces. In it you will find a trowel, weeding fork, cultivator, transplanter, weeder, pruner, spray bottle, a pair of gloves, a carrying bag, and instructions to boot. The tools themselves are well thought out and quality constructed. A good example of this is the transplanting trowel that has depth measurements right on it for ease of use. One of the best parts of this set is that it comes with a bag. Not just any bag, a good, well-constructed bag with good pockets. You will be able to put your tools in it and know they’ll stay in without any problems. You will be able to carry your entire set and them some from place to place as you go about your gardening work. This set is actually one of the cheaper options on our list. It isn’t the cheapest, but very close to. The best part about that is that it is a complete set that has everything you will need to maintain your garden - all at the cost of what one or two other tools on this list costs. Definitely a good bang for your buck here. This handy little tool will help you to have healthier, more vibrant plants. CLAW stands for Cultivate, Loosen, Aerate, and Weed - all of which are tasks easily accomplished with this unit. It is easily used in any soil at any time of the year, but is the most useful in turning over the first soil of the year. It was originally invented in Germany and is operated by a family owned business. This is a great option for those who have issues with bending over for whatever reason. It isn’t the easiest tool to use, especially in tough soil, but will very effectively get the job done much easier than any handheld tools will - and the best part is that it is all done standing up! Cultivating the soil has great effects on both your plants and the ground itself. It allows air and moisture to more effectively reach the roots of your plants which allows them to get the nutrients they need a little better and more easily which means they flourish. It also helps in your water conservation efforts as cultivated ground absorbs more water and has less runoff than hard packed soil. Like most garden tools on this list, this one is very affordable. It is reasonably priced and falls right into the middle of the pack cost wise. You will get a lot of use out of it for the price you pay and won’t suffer from any buyers remorse. If you have been looking for a pair of battery powered shears to clean up all your lines and keep your hedges in check, then these electronic shears may be a great option for you. They have sharp blades and a long lasting battery so your hedge, grass, or other various trimming tasks will be relatively frustration free. This unit comes equipped with a lithium-ion battery that lasts for about 90 minutes and will fully recharge in 6 hours. This gives you a cordless option that will make all of your routine maintenance much quicker and easier. The batteries are high power, which gives you better results. The blade on these Gardenia Clippers comes fully protected. It is a high-quality blade that is easily replaceable by you, the user, quickly and easily and no tools are required. The blade design is innovative and will save you hours of manual labor. These are easily the most expensive item on our list - hands down, no competition. They are very functional, however; and have the potential to make your life a lot easier. If purchased with the telescoping handle, they have even more utility and save you from having to bend over. If you are willing to pay for convenience, then these will make your life significantly easier. If not, then the price here might be a hard one to swallow. If you google “garden tools” a ton of information comes up. You can find all sorts of things from trowels to shovels, cultivators, weeders, and more. What is harder to find is a breakdown of what you need when. Really, the best way to go about choosing which tool you need is to have an idea beforehand what you want to use that tool for. From there, you can choose the best among a more limited set of options or you may even find that a multipurpose tool or set is the best for you. So, what are the essentials and what do you use them for? Knowing this will ultimately lead you to what you want to buy. A trowel is a mini version of a shovel. While they look the same, they don’t usually fill the same roll. A trowel is much, much smaller and meant for tasks appropriate for its size. It is perfect for digging to plant flowers, tucking seeds in, or moving small plants around. The best trowels also have measurements on them so you know when you are deep enough or need to go just a little farther. In essence, they kill two birds with one stone. A trowel is essential for any gardener. Shovels are meant for larger tasks. Things like moving rocks, digging big holes, and moving compost. You can put your foot on them for more leverage and they will typically have very long lifespans. Something to cut with, that is sharp and strong enough to do so, is a gardener’s best friend. It is essential if you want to keep your garden or even your yard well manicured and groomed. You have a lot of options here and the price range is as variable as the options. 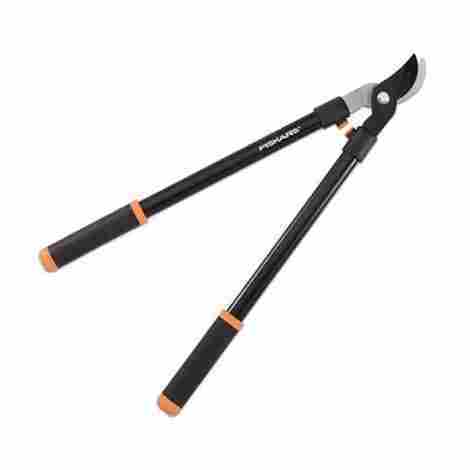 Loppers are great for trimming trees and anything with stems greater than ¾ of an inch in diameter. They are typically pretty long and allow you to reach much higher than you would be able to with a standard set of shears. They are also built in such a manner that they will multiply your strength and allow you to easily cut through said branches with minimal build up if you buy a quality set. You will want to make sure you get a bypass set – which means that they cut like scissors. Shears are great for many purposes. You can use them to deadhead perennials, cut thick stems of squash, or keep your bush or hedge looking great. They are typically smaller and easily used. You’ll appreciate how sharp they are and how smoothly they cut through various stems and branches smaller than ¾ of an inch. 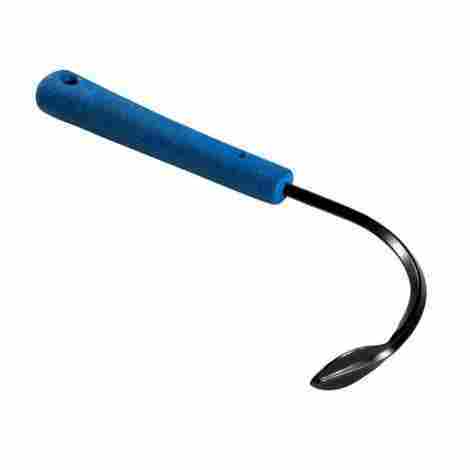 If you have a yard you need a weeder. Weed killer is available but can be complicated to use if you have kids or pets that like to run around your yard. When you don’t like that option, a weeder is a more natural one without any side effects like those you get from a chemical. Weeds are the enemy of every yard owner and having something that will easily take care of them can make a big difference. 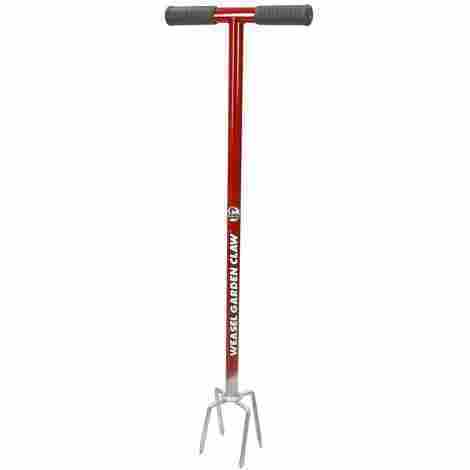 You can get great weeders that don’t even require you to bend down to use them. They are long enough and strong enough to pull weeds out at the roots and effectively take care of them. They typically come at a small price and will have long lives. The best part though is that they will extend the length of time that you can garden and tend to your lawn because they are helping your back and knees by not requiring you to bent or be in awkward positions for long amounts of time. Another garden essential is a fork and/or a rake. Garden forks are also called garden rakes, though the more traditional idea of a rake is for cleaning up leaves in the fall. A garden rake really is a miniature version of this and serves a similar purpose, just on a much smaller scale. They are great for lifting and loosening the soil as well as spreading things out. Garden rakes, in particular, are excellent for helping to dig up things like tubers, potatoes, garlic, and yams. The idea is that you can dig around them and be successful in not stabbing them. It is easier to do when you have a little bit of space between the prongs than just digging them up with a hand trowel, though that will also do the job just not quite as elegantly. A good garden fork will save you a lot of tragedies in digging and make soil preparation as well as removing all the leaves that fall a much less terrible experience, that may even begin to resemble something enjoyable. Obviously, the bigger the garden fork, the more like a rake it becomes and the bigger it is the bigger the jobs it is meant for. It should also be noted that the bigger it gets, the heavier it gets, and the more prongs a rake has made it suitable for increasingly heavy duty jobs. If you just aren’t committed to buying more than one tool, there are several great multipurpose options available. There are tools on this list even that are meant to help with digging, cultivating, and aerating. Typically tools that are meant to serve more than one purpose will ultimately replace tools that serve similar purposes. You won’t find a hand trowel that will be an adequate rake, it just isn’t a viable option. However; you can absolutely find a weeder that can also very successfully cultivate and aerate your soil. It should also be noted that you can buy many great sets for not much more, or even less, than what you would spend on a quality multipurpose tool. You can choose the number of pieces in your set – anywhere from 3-9 on this list – and a couple of them even come with a carrying tote. In conclusion, there are a lot of really good gardening tool options out there. What you need to get is something that fits your needs, lifestyle, and budget. If you have someone who takes care of your lawn and you only want to deal with the flower beds or the vegetable garden, then you may not need something that can dig weeds right out of the grass. Likewise, if you don’t have any hedges, then you probably don’t need a fancy, expensive electric trimmer that is really best suited for that task. What works best for you and your budget may simply be a trowel or a two prong garden fork. That is absolutely okay and exactly what you should buy if that fits the bill. A: There are a number of good tools out there, but some staples that you’ll need are a trowel, some sort of loppers or shears to cut with, a weeding tool, and a garden fork of some sort. Q: What do I clean my garden tools with? A: Best practice is to simply rinse them off after each use. However; if you end up with rust or want to do a deeper cleaning and maintenance session, you should scrub any rust off with steel wool, wire brush, or sandpaper. You will then want to lubricate it with a synthetic oil or a light machine oil to keep it in good shape. Q: What are the different garden tools? 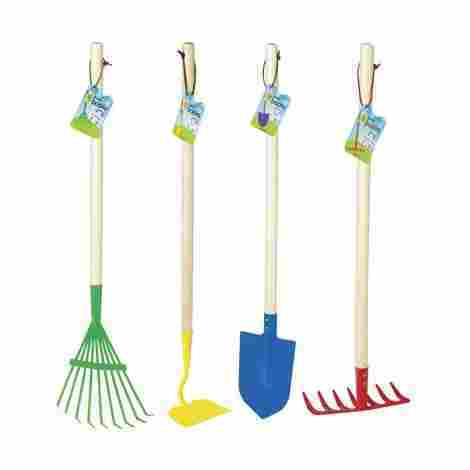 A: There are many different garden tools available. Some of the most popular and essential ones are trowel, weeder, loppers and/or shears, weeder, and garden forks. Q: Where do I get my garden tools sharpened? A: Any home improvement store will be able to sharpen tools for you. You can also sharpen them yourself if you have the expertise and the required materials. Q: How can I organize my garden tools? A: There are good organization bags available. They typically have sturdy handles and nice deep pockets to store your tools in. They also generally have a big inner pocket for storage of other various items such as seeds, gloves, etc. There are a couple sets on this list that include a bag – which is often the most loved and long-lasting part of the set. Q: Where can I buy garden tools? A: Garden tools can be bought at various home goods store, retail stores, or online. Anywhere that you would find a basic home and gardening needs, or flowers, plants, or seeds.